"Kindly avoid the State Council located in Charles de Gaulle in Giza due to the presence of a crowd there," Uber Cairo said in an SMS sent to their drivers on Saturday morning. The San Francisco-based company's text messages are its latest effort in a battle of survival against taxi drivers. Throughout the past weeks, taxi drivers have been organising weekly protests against both Uber and Careem, another Dubai-based company providing a similar transportation service in the Middle East. Taxi drivers accuse both companies of illegally stealing their livelihood and creating strife between taxi drivers and passengers. 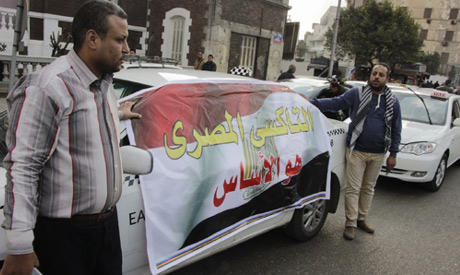 "I'm calling on the president and the prime minister to intervene and ban them," yelled a middle-aged taxi driver at a press conference hosted by the Egyptian Centre for Economic and Social Rights at the Journalists Syndicate in Cairo early February. Taxi drivers gathered to protest against the growingly popular Uber and Careem applications, even taking a swipe at the journalists who attended the conference, accusing them of "vilifying" and defaming them. But amid the air of anger, one driver said in a low voice: "I do understand that there is a need for us to improve our service. They want us to wear suits? We'll wear suits. We are not all bad, we do not all rip off our customers through the taximeters. We just want to live." A hashtag, "Taxi in Egypt", was launched on social media early in February to share negative experiences people had with taxis. Many said they have increasingly opted for Uber and Careem, complaining that many taxi drivers would rig their meters to "ripping off passengers." During the press conference, a group of taxi drivers launched the "We Are the Taxi" initiative, which aims at polishing their image and promoting the idea that they are the only legitimate cab service. This tug-of-war is not expected to end any time soon, with other players set to join Uber and Careem in the competition for the streets. The all-Egyptian ride-sharing company Osta, or The Ace, is set to launch on 3 March. Arguments about who dominates the transport business were sparked several times over the past century, with obsolete taxi services making way for more modern ones. When taxis first started making their debut in Cairo in 1924, carriage drivers organised protests against them, marching to the then-prime minister Saad Zaghloul's house to call for a ban on automobiles. He told the protesters technology had forced such a change. "Do you want other nations to surpass us and have us stay behind? If you want Egypt to move with the speed of carts, I’ll acquiesce to your demands. If you want us to develop with the speed of aeroplanes, I’ll do what you tell me now," the leader said. The cart drivers then chanted: "Like the speed of an aeroplane!" In 2009, drivers of Cairo's black-and-white taxis, which have all but disappeared, were disgruntled when the government released the current white taxis, implementing a programme of "vehicle scrapping and recycling" that aimed at revamping the service through newer and better-equipped cars. Drivers were allowed to replace their black-and-white taxis with the new white ones by receiving bank loans, with taxi owners still paying the instalments to this day, a financial burden occasionally referred to by drivers. Taxi drivers also say that a taxi’s licence and insurance fees, which private car owners do not pay, cost thousands of pounds. Taxi driver Hazem Abo Steit says the average instalments paid to the bank range from EGP 800 to EGP 1300 per month. The drivers have repeatedly protested following the 2011 revolution to call for the government to intervene and pay their instalments, as had been previously promised by the government. With drivers vowing to strike if not paid, the government has occasionally responded to their demands. White taxi drivers have made a key argument when voicing their demands; that Uber and Careem must be suspended in Egypt because they function illegally, as they use private cars whose drivers do not have taxi licences and do not have the financial and legal obligations imposed on taxis. Speaking to Ahram Online, Uber's operations manager in Cairo Abdellatif Waked said Uber is "licensed as a technology company in all the countries in which it operates," stressing that they pay taxes and carry commercial registers. Waked added that the Uber's partners – limousine and tourism, car rental offices – actually act as offices for anyone who wants to join Uber as a driver, saying these outlets are licensed and have their own commercial registers. One Uber driver, who also works as a lawyer and has asked to remain anonymous, says that the company is "playing a smart game." "How would I describe them? Foolhardy? They do not own a single car, so the country can never tell them they are working illegally," he told Ahram Online. "The limousine and car rental offices are being used as a cannon in front of the state. These offices do pay their taxes, so what more would the state need?" Several Uber drivers told Ahram Online that car rental offices dealing with Uber get a weekly fee from the drivers: EGP 50 weekly if drivers make EGP 1,000, and EGP 75 if they make less than the 1,000 margin. Meanwhile, Uber receives 20 percent of profits made by the drivers. At least three Uber drivers confirmed to Ahram Online that some car rental offices have hired their own full-time drivers to work with Uber in eight-hour shifts, with the drivers earning a fixed salary from these offices. Some taxi drivers have decided to take matters into their own hands by downloading the applications and using the newly introduced cash option to register on the application and request a ride. Within minutes, Uber's driver would arrive and the "fake" customer would ask him to head to the nearest police station, where he would then turn the driver over. Taxi driver Hazem Abo Steit told Ahram Online that they had turned over three Uber cars to the country's General Traffic Authority, and have filed an official complaint with the authority claiming that the cars were illegally operating as taxis. Uber driver Amr Aboul Kassem told Ahram Online that dozens of cars and drivers have been turned over to the police by taxi drivers amid the growing feud over the past weeks. Aboul Kassem said that Uber drivers' cars remain confiscated until they pay fines for taking on passengers in private cars. According to drivers, Uber has paid these fines and has expressed readiness to compensate the Uber drivers involved in these "ambushes." Uber has sent several text messages to their partners encouraging them to continue working. "We are on your side," one message read. Uber has advised its drivers to remove the car mount following reports of assault and vandalism by taxi drivers. According to several Uber drivers who asked to remain anonymous, these "ambushes" were made easier due to the cash option Uber introduced a couple of months ago and is currently beta testing. While the option is still not available to all passengers, registering on the system no longer requires a credit card, unlike when the app first made its debut in November 2014. Several drivers have suggested the cancellation of the cash option, which prior to the targeting of Uber drivers, Waked had deemed "very good" and said that it saw "positive feedback from drivers and passengers." "I personally believe that the Uber experience is a seamless one," he said. "What we do is adapt to the markets we are in. There is a big chunk of the population that wants to ride with Uber but does not have the means to open a bank account. We cannot just ignore this part." Other drivers are against cancelling the cash option, asking Uber to come up with other solutions to ensure their safety and that of their passengers. This is also the first time since the launch of such applications in the Middle East that the private services have faced a lawsuit from taxi drivers. Uber has faced harsh measures worldwide, seeing full or partial bans in several countries. Two Uber executives in France faced criminal charges in February for the "illegal storage of personal information and the operation of a service that puts passengers in touch with car-service drivers that have no professional licences." It is unclear whether Egypt will follow suit and adopt strict measures against these services, especially with the introduction of new Egypt-based ride-sharing companies that adopt the same model as the foreign ones. "I asked a passenger once about his reaction if Uber were to be banned in Egypt like in other countries. He told me 'we would not allow it. We would take to the streets in Tahrir Square to protest.' They can't do it. They can't," an Uber driver said.